Gwen Earle, Orange County Regional Director with the Better Business Bureau serving the Pacific Southwest will be our January breakfast speaker. The BBB’s mission is to be the leader in advancing marketplace trust. Every business regardless of the location, size or industry can be impacted by scams. Research indicates that scam activity directed at small businesses is increasing and creates a significant risk. Scams against small businesses can result in a higher monetary loss than those targeting individuals. This BBB presentation will provide some helpful information how to protect your business and employees from scams through preventative measures. Please be sure to RSVP for this event as space is limited. 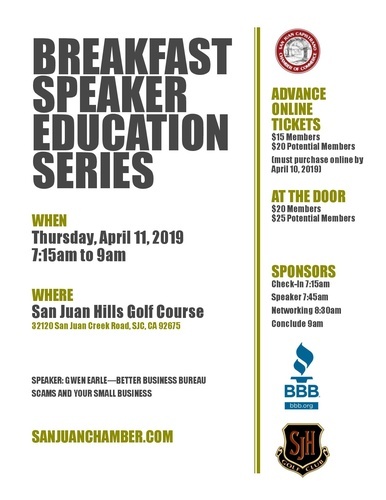 Email info@sanjuanchamber.com or (949) 493-4700. Cost is $18 for members and $25 for potential members (buffet breakfast will be served). Click the registration button below. If you are not a member, still click the registration button and choose the "non-member" tab.